For that special break in Cornwall look no further. Harbour to Horizon self catering properties, with boutique style interiors, are perfectly placed to make the most of their unique harbour settings in Charlestown and Mevagissey. Whether your ideal holiday retreat is contemporary, charming or elegant, memory making comes as standard, whatever the weather! Marine Point is a contemporary apartment perched high on the cliffs overlooking Mevagissey, and within a short walk of the distinctive twin harbour and fishing community. With its panoramic views from Gribben Head to Chapel Point, it is the ideal spot to relax and watch the fishing boats come and go from the harbour. 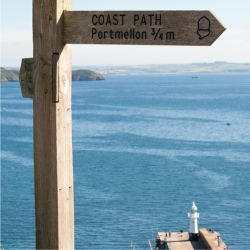 Situated on the SW coastal path and at the gateway to the Roseland, it beckons those just waiting to discover wide open beaches and sheltered bays. 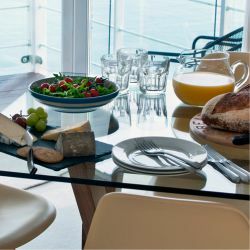 Seafarers is a charming HM Coastguard cottage overlooking the picturesque harbour in Mevagissey. Whilst retaining the character and features of a Victorian cottage, it has all the modern touches to make your holiday a luxury. It is the perfect base from which to explore the labyrinth of medieval streets, which twist and turn past ancient dwarf buildings of cob and slate, along with the cafes, shops and galleries around the harbour itself. The inspiring Lost Gardens of Heligan and the world renowned Eden Project are only a short journey away. Tall Ships is an elegant Georgian style property in Charlestown, within a stone’s throw of its Grade ll listed harbour, often home to a few square rigger ships. The setting is special, as the village is an amazingly pristine, unspoiled example of a late Georgian working port. It is easy to see why it is a key location for film and television productions such as Poldark. Why not be transported to a bygone era whilst experiencing the breath taking views over St Austell Bay? Each property has adjacent designated parking and is recommended by Cool Places (best self catering holiday properties in Britain).